In 2010, the Global Undergraduate Exchange Program - Pakistan (Global UGRAD-Pakistan) was launched by the Bureau of Educational and Cultural Affairs (ECA) of the United States Department of State. The program in Pakistan is administered by the United States Educational Foundation in Pakistan (USEFP) and in the United States by the International Research & Exchanges Board (IREX). Within a short life-span, the Global UGRAD has gained immense popularity among the Pakistani university going students. With the first batch of 100 fellows of the 2010-11 Global UGRAD-Pakistan returned to Pakistan to complete their undergraduate degrees at Pakistani universities. The Global UGRAD program is designed to award undergraduate Pakistani students enrolled at a university in Pakistan. The Global UGRAD-Pakistan program offers cultural/academic exchange through a non-degree program for a semester at a university in the U.S. Applicants of this program are required to be in either their 14th or 15th year of formal education. Students enrolled in either, a four-year bachelor's program or a two-year bachelor's programs are eligible to apply. Currently enrolled in a college or university and committed to returning to their home universities following the completion of the program. The Global UGRAD-Pakistan program is advertised every year (please check for availability) by September/October. Application form is required to be submitted online. All supporting documents, such as photocopies of transcripts including an explanation of grading scale of university issuing the degree, are to be attached to the online application before submission. Scan copies of all your university attested transcripts must be uploaded online including the most recent transcript. NOTE: Only selected students will be required to provide Reference Letters and No Objection Certificate (NOC) from their current academic institution. The Undergraduate Exchange Program is designed to award Pakistani citizens enrolled at Pakistani university or Colleges. This program offers cultural/academic exchange through a non-degree program for a semester at a university in the U.S. Applicants must be citizens of Pakistan who permanently reside in Pakistan. Students enrolled in either, a four-year bachelor's program or a two-year bachelor's programs are eligible to apply for the program. Students who have completed a two-year bachelors and are enrolled in the first year of their Master's degree are also eligible to apply (only applicable to students who have previously completed a two year Bachelor's). All disciplines are eligible to apply. 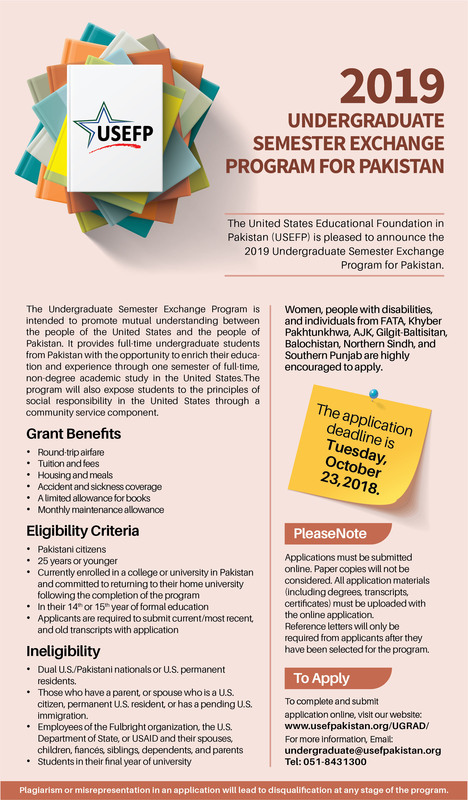 The United States Educational Foundation in Pakistan (USEFP) especially seeks applications from individuals from disadvantaged backgrounds and remote areas who would not otherwise have such an opportunity. Women, minorities and people with disabilities are also especially encouraged to apply. What is included in the Undergraduate exchange grant? The grant funds tuition, text books, airfare, a living stipend, accommodation and health insurance. Either Fall or Spring semester. I received an application form/printed out an application form from the website, now what do I do? Please note that since October 2014 the UGRAD application is to be completed and submitted online. Kindly keep in mind that once you have submitted your application online you are NOT required to mail USEFP the hard copy of the application. Before beginning to fill out the application form, it is imperative that you read the application in its entirety as well as the instructions that accompany it. The instructions provide specific information about completing certain points of the application. Be sure to fully complete the application form. If a section does not apply to you, please write "Not Applicable". Applicants will be required to take the TOEFL after their selection has been finalized and USEFP will administer this test. I'm doing a two year bachelor's degree am I eligible? You can apply for the program if you are in your first year and have a year remaining to complete your degree. However, students of four-year degree programs can only apply for this program if they are in their 2nd year or 3rd year (note that if you are in your 14th or 15th year of formal education you can apply for this program). I have completed a two-year bachelor's and now enrolled in a master's program, can I apply for this program? Yes, as long as you are in your first year and have a year remaining to complete your master's degree (note that if you are in your 14th or 15th year of formal education you can apply for this program). Note: Applicants are eligible to apply for this program if they have between 14-15 years of formal education. Education until Intermediate level is counted as 12 years of formal education. I am a medical student, can I apply for this program? Yes, you are eligible to apply for the program if you are in the second, third or fourth year. Please note that you will not be studying medicine during your program in the US if you are selected. Medical students with 5-year degree programs can apply for this program as long as they are in the 14th, 15th or 16th year of formal education. I have previously gone on a student exchange program? Applicants who have previously been on another exchange program in the past two years are not eligible to apply for this program. Students with no prior foreign experience are preferred. I understand that I must submit two letters of reference. Whom should I ask to write such a letter? Since October 2014, ONLY selected applicants are required to submit two reference letters. Applicants are NOT required to submit reference letters at the time of application submission. Consider asking teachers, advisors, or other professionals who are familiar with you and your work. If you are currently working /interning, ask your supervisor or other professional. Family members or other relatives are not eligible to write letters of reference. PLEASE DO NOT WRITE THE REFERENCE LETTER YOURSELF AND JUST ASK YOUR REFEREE TO SIGN IT. It is usually obvious when this has been done and it reduces the value of the reference. Please note that reference letters are not required at the time of application submission. Reference letters will only be required from applicants after they have been selected for the UGRAD program. USEFP's program officers will contact the selected participants with more information once the selection is completed. Since October 2014, the application is submitted ONLY online. Applicants will be sent an automated email confirming the submission of the online application once the application is submitted successfully. For the applicant's records, the confirmation email will contain the applicant's application ID number as well. Please do not call or email to check! No original documents (hardcopies) are required to be mailed to USEFP for the application review process but all your documents will need to be scanned and uploaded to the online application by the deadline. Make sure that the scanned documents are attested/verified by your university before you upload them. Round 3: In-person interviews of short-listed applicants will take place in Islamabad between January and February. The interview panels are made up of both U.S. and Pakistani citizens. Round 4: Final candidates and alternates will be selected in April-May. Applicants who have become finalists or alternates will be notified by telephone. Those who have not will be notified by mail. Yes, finalists will be required to submit a completed Medical History and Examination Form. No, you cannot defer. You can, however, decline the grant and reapply for another cycle. No, The International Research and Exchanges Board (IREX) will find an appropriate placement for you.